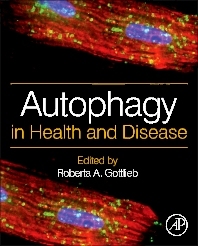 Autophagy in Health and Disease offers an overview of the latest research in autophagy with a translational emphasis. This publication takes scientific research in autophagy a step further and offers integrated content with advancements in autophagy from cell biology and biochemical research to clinical treatments. A necessary reference for the bookshelf of medical and scientific researchers and students, Autophagy in Health and Disease presents high quality, reputable information on autophagy, allowing the reader quick access to the most applicable information. Researchers, graduate students, and professionals studying autophagy across cell biology, biochemistry, medicine, and biomedical sciences. Autophagy in Human Diseases: A Guardian or Executioner? The Role of Autophagy in Aging: To Help Live Longer? Dr. Gottlieb has been conducting NIH-funded cardiovascular research for the past 20 years. She has prior experience with The Scripps Research Institute (TSRI); SDSU where she became the first Director of the Donald P. Shiley BioScience Center, and currently as the Director of Molecular Cardiobiology at Cedars-Sinai Heart Institute. The work in her lab has led to the discovery of the cardioprotective agents and the elucidation of their novel mechanism of action. Her expertise in cardioprotection and autophagy is recognized on a national and international level. Dr. Gottlieb is also an entrepreneur, having started a biotechnology company called Radical Therapeutix, to develop drugs to mitigate the damage to the heart during myocardial infarction. Dr. Gottlieb received her B.S. and M.D. degrees from Johns Hopkins University.